Research has concluded that new generation anti-depressants have little clinical effect on the majority of depressed patients. The University of Hull team examined data from 47 clinical trials on several leading new generation anti-depressants. The drugs work by increasing levels of the mood controlling chemical serotonin in the brain. They included drugs in a class known as Selective Serotonin Reuptake Inhibitors (SSRIs), such as fluoxetine (Prozac) and paroxetine (Seroxat). Another drug, venlafaxine (Efexor), was also examined. The new generation anti-depressants had no more effect than a dummy pill for people with mild or moderate depression. They found the drugs did appear to have more benefit for people with severe depression - but even then the effect was relatively small, and open to question. The main finding among severely depressed people was that they ceased to respond to a dummy placebo pill, not that they showed a particularly heightened response to anti-depressants. Does this mean that the drugs are effectively useless for most? No. Many people say that the drugs have given them much needed help. However, the latest research suggests that the effect of the drugs may be largely psychological - people feel better because they believe they are taking a medication that works. This is commonly known as the placebo effect. If this is the case, then the active ingredients of the drug may be less important than the fact that people believe they work. Do many people take these drugs? Yes. Prozac alone is taken by more than 40 million people worldwide. 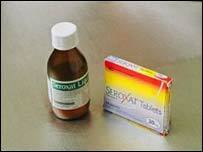 Figures show that 16.2 million prescriptions were written for SSRIs in 2006 in England alone. This is despite the fact that they are not recommended as first-line treatments for people with mild depression. Many experts believe that talking therapies, such as cognitive behaviour therapy, are a more productive approach. In England, the Department of Health has announced its intention to train up many more therapists to meet increasing demand, and tackle poor access to services. It is estimated that as many as one in five people suffers with depression at some point in their life. Should people stop taking the drugs? No. Experts stress that nobody should stop taking a prescribed medication until they have sought professional medical advice. What do the drugs companies say? They say their products have been extensively tested and shown to work. The Association of the British Pharmaceutical Industry admits that there may be a considerable placebo effect involved, particularly in the treatment of patients with mild to moderate depression. However, it says the effect of the drugs cannot be put down to the placebo effect alone. Was all the data on the drug trials made publicly available? No. The researchers had to use Freedom of Information legislation to gain access to data that had not been published. However, this data was available to the authorities considering whether the drugs should be licensed. But not all of it was available to the National Institute for Health and Clinical Excellence (NICE), when it made its original assessment of whether the drugs should be made widely available on the NHS. Critics say drug companies should be compelled to publish all trial data, regardless of whether it shows their products in a positive or negative light. Do the drugs have side effects? The new generation drugs are thought to carry a lower risk of side effects than their older counterparts. However, some research has linked SSRIs to an increased risk of suicide, and in the UK all but Prozac are considered unsuitable for people under the age of 18.